How Much Walking Is Equivalent to Running? A walking buddy helps you stay motivated while you walk the pounds away. Walking is easy on the joints and a great way to bond with a friend, but let's face it -- running burns a lot more calories in the same amount of time. Because it's vigorous exercise, running also offers a few benefits -- like high afterburn and an intense heart workout -- that walking as a moderate exercise can't always match. But that said, brisk walking offers a host of cardiovascular and other health benefits, it's practically injury-free and, most importantly, you're likely to stick with it long term. And If you've got the time, you can burn just as many calories walking as even the fastest runner. Strolling along with your sweetheart at an easy 2 mph does burn calories -- at an equally leisurely pace. If you weigh 125 pounds, you'll burn only 76 calories in a 30-minute stroll, while your 200-pound friend burns 121 calories when taking the same walk. Your calorie expenditure varies according to your pace and weight. Because of those excess pounds, a heavier woman's body works harder as she walks, burning more calories than a smaller woman's. A brisk 3.5 mph walk jumps your calorie expenditure, bringing it closer to the calories burned by jogging. 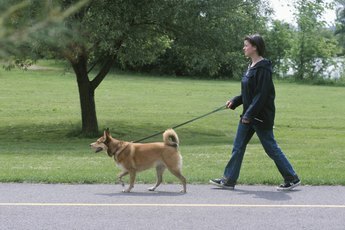 At 125 pounds, you'll burn 110 calories in a half-hour walk, while jogging at the same 3.5 mph pace burns 190 calories. 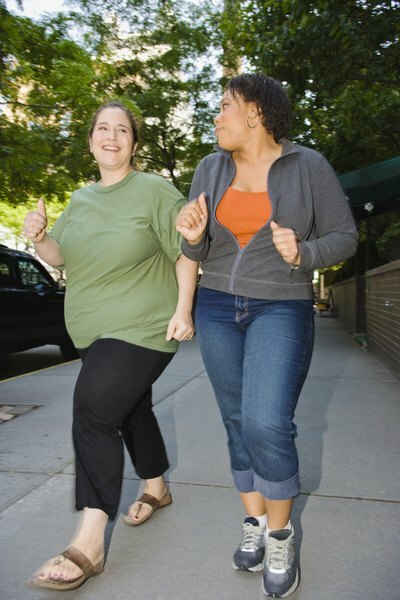 Your 200-pound friend burns 176 calories while walking and 304 calories while jogging. You'll have to walk 52 minutes to receive the same calorie-burning benefits as the 30-minute run. Race walking, also known as power walking, is a fast 4.5 mph walk that allows you, at 125 pounds, to burn 182 calories and your 200-pound walking buddy to burn 292 calories in 30 minutes, according to ExRx.net's Walk/run Metabolic Calculator. Meanwhile, by taking a 30-minute, 4.5 mph run, you'll burn 235 calories while your buddy burns 377 calories. As you pick up the pace, the calorie-burning ability of race walking increases, allowing you to receive the same benefits as a 30-minute, 4.5 mph run in only 39 minutes. Once you increase the pace to a 7.5 mph run, you'll burn 372 calories for a 30-minute run while your friend, at 200 pounds, burns 596 calories. To burn the same number of calories while taking a brisk 3.5 mph walk, you'll have to walk an hour and 41 minutes. Even at a race walker's pace of 4.5 mph, your walk will take 61 minutes to make it equivalent to a 30-minute run. Runner's World: Running v. Walking -- How Many Calories Will You Burn? How Can You Break a Sweat Walking? What Does Jogging Do for Your Body? Does Just Walking on a Treadmill Do Anything? 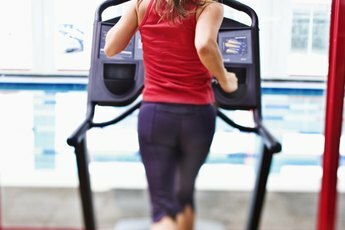 Does the Elliptical Have the Same Benefits as Jogging? 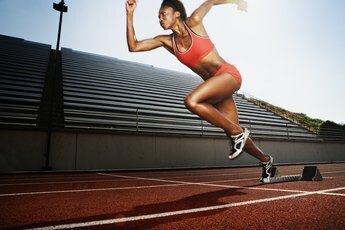 Is Sprinting Better for Losing Weight Than Distance Running?